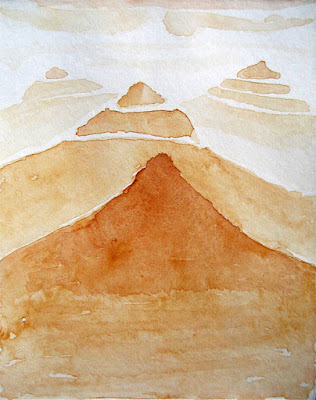 In this post, I am sharing with you, the two very simple watercolor paintings. For beginners like me, simplicity is almost a necessity because it allows us to focus on the core subject rather than get dismayed by the distractions. Painting with watercolors isn't a joke and it requires a lot of practice. As a newbie, we apply watercolors randomly - in whatever way we like - but there are certain techniques that should be followed to give an artistic effect to our arts. These techniques can be learnt either through reading and research or from practice. In this palm tree painting, I have simplified the scene by removing all the distractions but now, I think that a suitable background is necessary to give the painting a more realistic look. Also because of my tendency to make neat and clear painting, I perhaps didn't do justice to the watercolor medium. I have varied many colors in the leaves and I think that part is good. Another good thing I have done was in making the brick-like structure in the house. So, I would say this is a simple painting but not good enough for everyone to appreciate. This second scene is a simple landscape of desert mountains or sand dunes. This painting is technically a bit better than the previous painting but lacks the attraction in the subject which makes it look more like a monochrome useless painting. I say that it is technically correct because the farthest mountains are dim as compared to the nearest mountains and the horizon is blurry! Moreover, in the panting front, I haven't tried to be too neat with this one. Those are my self-comments about my own works. I wish to know your views and comments too. So, don't hesitate to comment on them. I will welcome any type of critiques and comments from you. Thank you Frank for your comments. I added that brick-like effect out of my own imagination because the actual house was far away and was full of shades. I had however, cleared up all the clutters and hence I needed something compelling. And that effect was what I came up with! This palm looks very real and beautiful, good job! Thanks for you candid comment. I agree with you that these paintings are not good for an expert's eye. However, you would agree that they are simple and are good to practice for beginners. Very nice paintings. 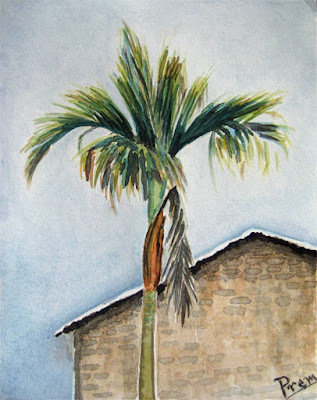 :) came across your site looking for a watercolor technique for palm trees...I've looked at dozens of paintings and your method does full justice to the beauty of the tree. (hmmm, I do not think "Anonymous" was right. Your paintings are quite good!). Sorry, I have to use the "Anonymous" setting also... My name is Susan.